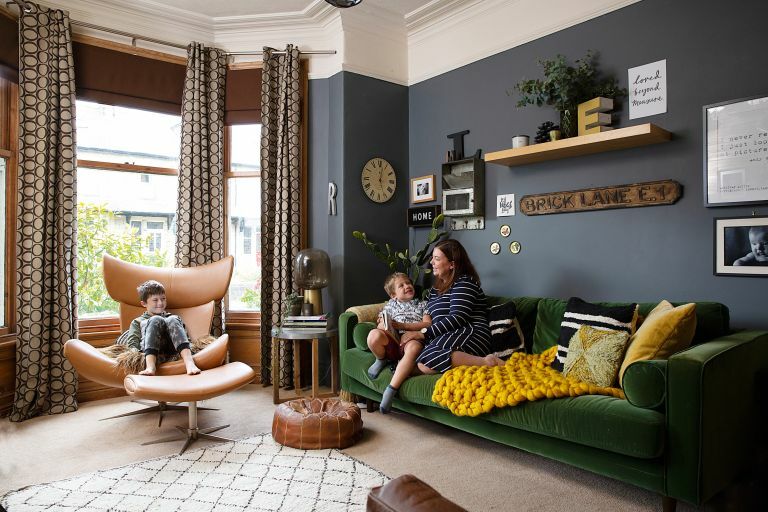 Since she snapped up her Victorian terrace in Ilkley, Instagrammer Nicola Broughton – otherwise known as the Girl with the Green Sofa – has transformed it into a luxurious and individual home for her and her family on a budget. It’s Nicola’s clever way with DIY that brings this house to life – to her a daunting task like panelling a wall is as easy as nipping to B&Q and spending an afternoon in overalls. A home this colourful and unique can only be packed with tips, and with Nicola’s DIY know-how and effortless style, we were keen to hear how she does it for ourselves. Find out how she did it then browse more real home transformations. Find out how to renovate a house from top to toe, too. 'The living room was the start of my Instagram journey,' Nicola says. 'I’d seen how other people were decorating with dark colours and decided our living room was too light – I wanted it to be cosy. One lunchtime, the rollers came out and I painted the walls. 'Our old Chesterfield sofa gave up the ghost when the kids bounced on it one time too many. I managed to persuade Sam that it was a good idea to buy a green velvet one. 'Most of the furniture is salvaged, and we kept the original fireplace, too. There’s a BoConcept chair in the window – it’s Jack’s football-watching chair and Alfie likes to curl up in it to watch his iPad or read. 'We knocked the dining room through into the kitchen early on and I painted everything in light colours. I thought we’d move on at some point so tried to create the house someone else would want. But then I realised we wouldn’t actually need a bigger property, and decided to decorate for me. From stunning readers' homes to extensions advice and decorating ideas, each issue of Real Homes magazine is packed with inspiration. Get the magazine delivered straight to your door every month with a subscription. 'The wallpaper in this bedroom is by Feathr. They started out by basing their work on art because it’s their belief that there’s not enough beautiful, unique wallpaper out there. It’s also a lovely flower print. 'I buy from a lot of smaller businesses. Quite a lot of them find me, but historically, they’ve been around as long as I have on Instagram, before it got so crowded. Someone posted about this wallpaper so I posted about it as well and that’s how they got in touch with me. 'We decided to remodel the top floor to get a bit more room out of the property. We knocked into the eaves in Jack’s room to make a cupboard, and did the same to Alfie’s room to open it up – there’s a sofa in that space now. We went from five to six bedrooms just by knocking into the eaves.